This is the X6 version. 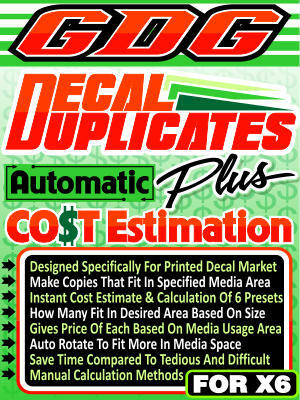 The main purpose of this macro is intended for those who print decals, labels, or other items in quantity. The first main feature of the macro is intended to duplicate a selection as many times as needed to fit it within a desired media space. It can rotate it if need be to fit more as to prevent a large amount of wasted media. The macro performs this function very fast, even with very complex designs. This is the X6 version.